Welcome to the most nerve-wracking NFL fantasy game on the planet. 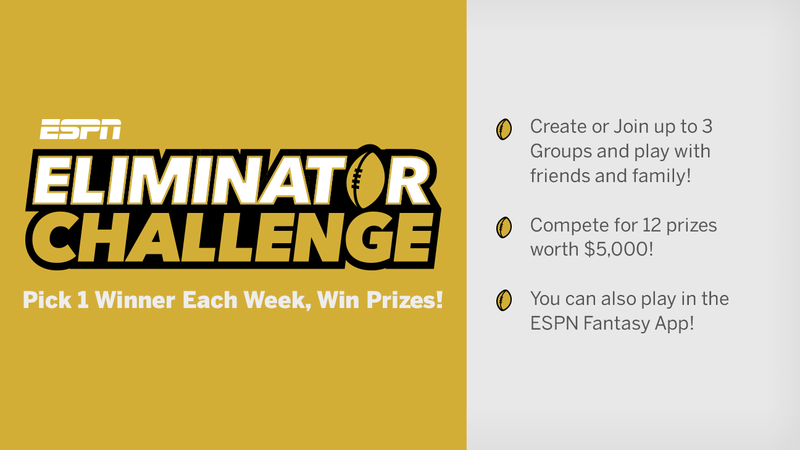 The beauty of Eliminator Challenge lies in its simplicity: every week you're asked to pick the winner of one NFL game straight up. If the team you choose prevails then you advance! The only caveat? You can only use a team once during the season. And so the strategic intricacies and decisions emerge. Do you map out the entire schedule ahead of time, assuming the teams you feel are strong at the start of the season can remain that way for all 17 weeks? Do you take the biggest favorite every week and hope to consistently survive the dreaded upset? Perhaps you save an elite team for a juicy matchup down the road and rely on one that's less favorable to carry you through. In the NFL nothing comes easy. It's usually the matchup you overlook that gets the better of you, and if that happens your season is over. That's right: if you lose even once you're out. While devastating in its abruptness, the challenge of having to survive and advance each and every week is what makes this so fun to play. The Packers (-8 v. CHI) are the second-largest favorites of Week 1, but they will garner larger spreads later in the year. Do you burn them early with a good shot to live for another week or do you stash them for a better opportunity? Another option would be to risk it all on the Ravens (-6.5 v. BUF) in what on paper looks to be their best chance of the year for a win, potentially going against a team with a QB making his first-ever start under center. You'll have to eventually select 17 of the 32 teams if you want to go the distance so a Super Bowl contender can't always be in your corner. It's a risk, but one that could pay a high dividend. Whatever you choose to do there's sure to be a time when you're sitting on the edge of your couch wondering why you decided to stake your entire season on a team that's now losing in the 4th quarter. It's inevitable. But there's sure to be another week when you're in the clear and good percentage of your competitors are facing a similar situation. Enjoy the ride!